The NY Times has a great piece on Dr. Diamond's theory and the academic debate amongst anthropologists. 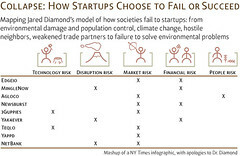 The above mashup is based on their infographic about the model and collapsed civilizations like the Maya, and it serves as an excuse to discuss the risks facing startups. Market risk is the big one. A little startup has very little control over market size and penetration. One way of managing this risk is to go after bigger markets, in which gaining a sliver is still substantial. People risk is all about the founding, management and larger team. Get this one right and not only can you execute, but have fun along the way. Get it wrong and it may be painful. Technology risk is both managing technical complexity and innovation as well as product management. Some say this risk can be managed with sufficient resources, but it is more about the timing and activity of resources against the pressure to go to market. Financial risk is the ability to fund the company to get to profitability. This is both a function of capital formation and the ability to execute on revenue. Many in the deadpool failed to do the former, but largely because of the latter. I find that any substantial startup risk, and inherent reward, can fit into these five categories. Marc Andressen has a larger post exploring edge cases in the context of when VCs say no. I'm actually with the anthropologists in this debate, where such simple frameworks help you think about where to pay attention, but larger forces are beyond an entrepreneur's control and vary significantly. It seems some of my fellow enterprise software bloggers are missing the point in Robert Scoble's post. The consumerization of the enterprise is one of the bigger trends reshaping enterprise software. Ask any user of enterprise software if they love it and the answer is no. This will increasingly matter attracting and retaining employees. Especially as NetGens enter the workforce, the biggest demographic shift since the Baby Boomers, and the fact that they choice in tools to get most of their work done. Enterprise software can do better. In fact it has to, because of broader competition. At least with basic usability. And with due bravery to buyers about the actual return with users are served. Step out of the feature matrix. Also recognize that control instincts lead to unusable crap that is a barrier to collaboration. And every enterprise software app is a collaboration app, otherwise its infrastructure. What works against doing better is how institutional procurement will always demand direct relationship and mass customization. Whereas consumers need less customization (nare I say fads) and are served at a high volume, where intimacy is achieved through brands. We're experimenting at the margin with new models such as SaaS and Open Source, which needs to appeal to people instead of institutional procurement. It may be the first way into an institutional sale, and it does have different demands. But the inherent lack of focus for a vendor, between consumers who happen to work in enterprises and the institutions that bind them, is great. We're also doing a lot of experimentation around social software, which in consumer markets helps get them laid. Enterprise social software can't do that without risk of lawsuits. But it can help people get promoted. Yesterday I went to the Internet Identity Workshop at the Computer History Museum to explore one question -- if you had a test market where identity standards, infrastructure, user preferences and adoption where in place, what kinds of policies and identity services would emerge? With 1M Estonian eID smart cards, GSM SIM cards and open.id.ee in beta -- 80% of the population has adopted identity infrastructure from the top down. With OpenID enabling internet identity, support from Microsoft, Google and many Web 2.0 startups, and spawning further collaboration such as Oauth, the potential for innovative identity driven services is significant. The first phase of identity driven innovation in Estonia has yielded 89% of banking transactions online, 80% of tax returns filed electronically, legally binding eVoting, and mobile payments. Identity is the missing layer of the internet and now there is a little country that could help innovators leap ahead. So if you assume this short term future, you get to to imagine new internet identity services for testing in a real market. You also get to think through policy considerations. Government and regulation will inevitably be involved with internet identity, especially where the trust relationship between citizen and state provide the basis for it. Even when the state provides the basis of identity, there will be other means to establish it on the net, a diversity that creates its own check and balance. Some people, particularly in the UK with its recent privacy breach, resist the natural role of government in identity. To do so not only is a barrier to constructive conversation with lawmakers, but it ignores the existing body of law around identity in the real world. Government sees two categories of data, especially identity data -- public and private. As in public sector and private sector. But there is also a third: user-originated. He [Iain] believes the majority of data government care about in ten years will be generated by individuals, as the point of origin, and also as the point of service integration. An analog to the multiple-silo problem is the fact that governments tend to see individuals as a collection of silos as well. There is no integration between health services, civil defense, taxation, social services, education and the rest of it. The individual needs to be equipped to be the point of integration from the data standpoint, and the point of origination for service requirements. That goes for relationships with both government and business. This is the essence of VRM, and where VRM and identity meet. Later in hallway conversation with Doc and JP Rangaswami, JP described the need to shift the focus from data (can I get my identity data in and out from a service provider?) to relationships. He pointed out that the relationship you have with your lawyer or doctor is privileged by law so you have greater trust in sharing your identity. Identity relationships exist between citizen and state, citizen and firm, firm and state, and firm to firm. The last two hold the greatest concerns. When you assume identity infrastructure and adoption, you can explore these policy questions. 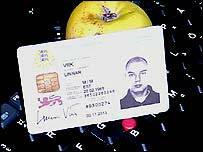 Individuals will originate an increasing amount of identity data. Could letting individuals have control over their identity relationships yield better data? Could it even be a human right in the digital age? What can we adapt from the seven laws of identity into real law? Could mandating personalized disclosure statements provide balance to relationships and begin the conversations that form real relationships between citizen and firm? Would the right forward looking policies in a test market like Estonia yield greater investment, innovation and citizen satisfaction? If you are in London this Wednesday, go see Jimmy Wales speak, perhaps in mention about the Creative Commons licensing of Wikipedia. If you are in San Francisco, go hear about Davis Wiki, my favorite example of a local community wiki. If you are in Portland, wiki inventor Ward Cunningham is bringing in the holidays.